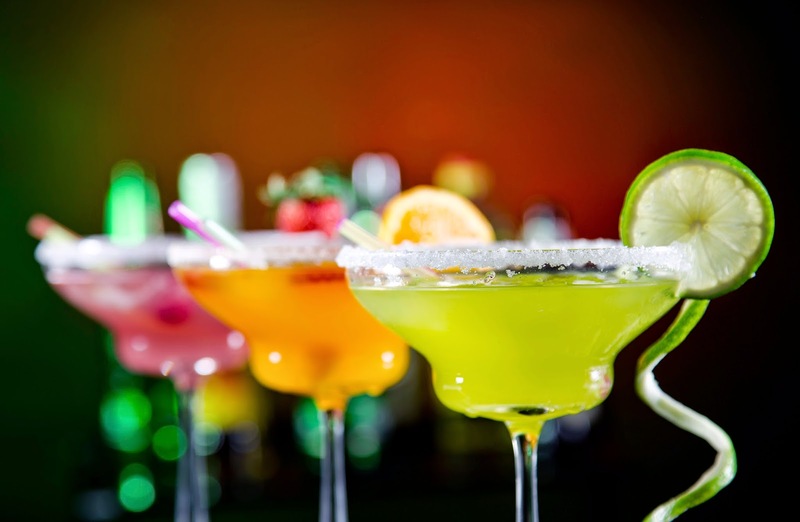 A cheap cocktail is worse than no cocktail. So it is with many blended learning courses. They try, but it's all very limp as the tendency is to include too many things, especially old ingredients, rather than working out a blend that is sound in terms of learning theory, resources and and costs. ‘Blended Learning’ is so often just ‘Blended Teaching’, a half-hearted attempt to retain a mixture of classroom and online. It’s Velcro learning, slamming just a few of things together to satisfy a need to hold on to some of the old and look as though you’ve embraced some of the new. So much learning is determined by the fossilised mode of delivery; lectures in Universities, classrooms in schools, round tables and flipcharts in corporates. What's needed is an attempt to take Blended learnng seriously. This slicing and dicing of the ‘teaching’ process is not what Blended Learning was meant to be. When it arose (in corporate learning), it promised to lift learning out of its obvious predicament – the dull delivery of overlong, flipchart-driven classroom courses. This never happened as few took it seriously enough to do take learning theory seriously, consider a wide range of options and do the necessary analysis to produce an optimal blend. The reason for this failure is that L&D really doesn’t want to listen to what learning theory has to tell us and the Blended Learning tag is often a useful way of consolidating the past not the future. The psychology of learning screams at us, telling us that successful learning, retention and recall, that leads to good performance, needs to be sensitive to a learner’s starting state, personal needs, personalised learning, practice by doing, then spaced practice to consolidate what is learnt in long-term memory. Blended learning also screams at us to take this ‘learning’ theory seriously. So here’s ten tests one can apply to distinguish a Blended Learning from a Blended Teaching solution. First up. Have you really matched your blended learning components to the type of learning experience you want to deliver, to maximise the effectiveness of your blend? This is all about blended learning, so the channels you choose and media mix you choose should be matched to the learning outcomes. In practice, courses are still too dominated by overlong ‘presentations’, too much ‘text’ and not enough active and experiential learning. Unless you’ve really mapped your delivery channels to efficient learning outcomes, using an evidence-based approach to selection, you’re delivering Blended teaching, not Blended learning. An optimal blend is built from the bottom up, not just preserving some of what you've done before and something new. It may well be possible to eliminate F2F learning entirely. It may also be hte case that you can elminate all onine learning completely. Don;t start with assumptions about 'essential' components in a blend. That's not blended learning, that's the very thing that Blended learning was designed to avoid. You can blend all you want but if you have unsuitable candidates for the course, it will make a marginal difference. Batching trainees through courses, without pre-qualification and pre-testing is still far too common. And forget that hokey, Honey & Munford learning styles questionnaire, where you pigeon-hole, then all subject all to the one-size-fits-all course anyway. No pre-selection or pre-assessment, no blend. In any group of learners, some will come with pre-requisite knowledge and skills. There will be a distribution curve of some sort. Most trainers, especially those parachuted in as suppliers, will know little or nothing about the learners. Yet how often is a course sensitive to the different skill levels of the learners – rarely. This builds in massive inefficiencies. Blended learning means blending out these inefficiencies. Is your course, essentially a one-size-fits-all experience? As you proceed, does the system adapt to your personal needs or simply deliver content in a largely linear fashion, so that your learning journey is on a bus along a fairly well prescribed road? Is the experience really reacting to you as a person (blended learning) or the agenda of the trainer or designer (blended teaching)? Norman Lamont’s suggestion for Room 101 was 'Click Peter, Nancy and Ashraf to hear what they have to say. And no, you can't move on until you've listened to Peter, Nancy and Ashraf.' If something like this appears in your course, don’t dare call it blended learning. There are opportunties now to introduce adaptivity and links out to content to satisfy individual's curiosity. How many ‘blends’ start with really providing the opportunity for learners to actually apply what they’ve learnt, in either a seriously simulated or real environment? An airline pilot would be expected to be trained, assessed, even certified using flight simulators, yet how many leaners are expected to actually train in such a focussed, relevant and sophisticated environment? The reason is that pilots go down with the plane. Similarly in the military and to a degree medicine, simulations matter, as people can die. If a blend doesn’t off real opportunities to learn by doing – it’s actually blended teaching, not leaning. Most courses are sealed off from the actual workplace and real context in which people work. Does your blend, blend the learning experience with what people are expected to do in real life. How many references, examples and activities are linked ot the world of work? Are learners expected to try out their new found knowledge and skills? Are they asked to apply these to the world of work? If not then there may be a gaping hole in your blend. Performance in the workplace is all about automaticity, the immediate recall of knowledge and/or skills that allow one to perform as expected. Yet how many blended courses actually assess for automaticity? Precious few. Multiple-choice questions don’t come even close, as the learner is simply selecting from a list, recognising a given answer, not actively recalling the answer. Quick and active recall is much harder to assess. Blended teaching tends to promote poor assessment. If you’re not assessing active recall and the application of knowledge and skills, that’s not a blend, it’s ignored actual performance. Despite 130 years of research and science showing that the forgetting curve, with rapid and permanent decay from memory, is consistent and predictable, spaced-practice is consistently ignored and excluded from blended designs. Why is this? Well, when the focus is on Blended Teaching, the mindset is of delivery channels to learners (e-learning, classroom, resources, social media etc.). Once the learner has exited the blended course, you’ve lost them. Of course, you haven’t, as the technology, especially mobile, is an umbilical cord to them and into the future. You can deliver spaced practice, so ask yourself whether you really have a blend if spaced-practice is missing? Go for strong formative assessment, even summative assessment at the end of modules and courses but to be relevant, and align your efforts with the organisation, you must look for real business impact. This may mean measuring actual performance down the line, long after the forgetting curve has eaten away at your learning gains. How often do you see costs mentioned in relation to an optimal blend, and if they are, they are of such low quality as to be meaningless. Have you really costed out your different blended components, not just in terms of cost-benefit analysis (CBA), but cost-effectiveness analysis (CEA). These are different. The latter need alternatives that show greater productivity relative to their costs, i.e., that are more cost-effective and more efficient in the use of social resources, should be preferred for adoption and implemented more intensively. Here’s a thought experiment. Regard all ten of the above as necessary conditions for being called a Blended Learning course. How many would pass muster? Many courses I’ve seen in over 30 years in this business don’t have a single one of the above. The majority have one or two at most. Note that this is not an argument against Blended Learning. It’s an argument against Blended Teaching masquerading as Blended Learning. It’s an argument for putting ‘learning’ at the centre of the process, not just reshuffling the deck of teaching channels. Last year I was due to go to lecture and deliver workshops at the University of Nigeria. I got my yellow fever injection, malaria tablets, went through the rude and depressing process of getting my visa at the Nigerian Embassy in London. In the end, the trip was pulled. The University had received bomb threats from Boko Haram. These people wanted to blow ME to pieces. But why? Why is ‘education’ the target? Boko Haram means ‘Western Education is sinful’. What does that mean or at least signify? Why have they targeted education in particular? Why the gender war? Surely education is a universal good? Well, we must look behind the horror to see what’s happening there, as education, in particular our model, is NOT seen as a universal good by all. Let’s start at the top. The African elite send their kids to Western Universities, many of whom return (if they return at all) to continue the cycle of despotism and corruption that their parents used to enrich themselves. Note that much of the money laundering takes place right here in London by our own breed of university-educated lawyers and city accountants. This is relevant, as the resources that should have gone to northern Nigeria, have gone to a tiny elite both in Nigeria and here in the UK. Western Education at that level is as much a problem as a solution. It is corruption by the Nigerian Government, both in the power that now remains in the south, starving the north of resources, and in the north itself, particularly in Borno state, the poorest state in Nigeria, that has caused a loss of hope in the large numbers of young, employed youth. We have seen these viscious fundamentalist groups arise across Africa, some with Christianity at their heart - take Uganda's Lord's Reststance Army. The answer to bad schooling is always more schooling. Just get every child into school and all will be well. Well – no. As a goal in itself, and it is a Millennium goal, it is not nearly enough. The problems occur when these kids leave school. School is not always relevant. The standard image of African kids, in colonial type uniforms, sitting in rows, with a chalk-board and teacher, is not what is needed. Africa, above all, has a form of schooling that is deeply colonial, defined by the academic systems in Britain and France. In fact, it is a dated and inefficient system, with poorly trained teachers, limited and irrelevant curriculum, with massive teacher absenteeism. The experience is often an irrelevant ‘going through the motions’ process of rote learning, with little effort put into making it relevant to the lives of those children. Do they really get what they need to know in terms of their farms, health, energy needs? Does it give them what they need to be autonomous adults when they leave their schools? No. Our model is a knowledge-based model and that’s what we export to them, often ignoring the cultural and practical context in which education is delivered. Western schooling in itself is not a solution. Gordon Brown and the educational evangelists confuse the means with the ends. School is not an end in itself, it is a means to an end. Yet, so often in poorer countries, it is just an end. Children leave school. We all leave school, except educators and academics, who stay on to deliver more schooling. So let’s not see schooling, as if it were a universal, intrinsic, objective good-in-itself. At the tail end of this educational colonialism in Africa are the pat solutions parachuted in by the technological evangelists such as Sugata Mitra (my critique) and Negroponte. Let’s not pretend that the solution here is a hopelessly utopian Rousseau-inspired idea that children will do it for themselves, if only we just parachute tablets into their villages and drill holes in their walls for computers. This is a disgraceful form of utopianism that promises technological salvation but it’s a con. The holes in the wall are now precisely that, empty holes, that leave a nasty legacy of failure. Believe me, I’ve seen them and spoken to the people whose lives were affected by this nonsense. Is it any wonder that many of the people on the receiving end of this patronising process feel resentment? I have no sympathy with Islamic religious education or fanaticism and it’s attitudes towards education and women, nor their form of education, which is based on recitation and rote learning. But that also means I have little sympathy with faith-based education full stop – be it Jewish, Muslim or Christian. We are not without fault in out own country with a huge slug of Church of England bishops ensconced in our House of Lords and a rise in problematic faith schools. But let’s not export our idea of education to the rest of the world as if it were a silver bullet leading to the emancipation of women and growth in all economies. Ha-Joon Chang and several other economists buck the orthodox trend among neo-liberal economists, who state that education is what makes countries richer. This is simply not true. In addition to education, you need a stable political system, and post-school infrastructure that creates jobs for young people when they leave school. Paper-pushing education can in fact hinder this process. 18th century Britain, 19th Century US and Germany, more recently South Korea, Taiwan and China, did not surge forward on the back of ‘education’. If anything, education was a by-product. They had a holistic view of government, policies, targeted spending and purpose. The failure in northern Nigeria is the presence of colonial type schooling in a world without hope. It promises everything and delivers precisely nothing. It’s easy to Boko Harum them as lunatics but look beyond the headlines and you’ll see a general revulsion of Western interference and values. In many places our ‘schooling’ is received with suspicion and resentment, as it doesn’t change anything. In fact, it eats away at your existing culture, isolating children from the realities of that culture and economy, then spits them out at the end – into nothing. Is it any wonder that they turn to stable, ideological causes, whether it be fundamentalism or insurgency. In that context they have a purpose, a job, a community-they are respected. The vast majority of Boko Haram fighters are boys and young men who had nothing but see, in Boko Haram, something that gives their lives meaning, a gang, a place and a purpose. Education without employment doesn't give you this. Until we waken up and see contextualised education as the solution i.e. real practical, vocational skills, not just chalk and talk lessons to wooden benches, we’ll reap what we sow. As I was writing this piece King Abdullah of Saudi Arabia died. Let's not forget that it is the Saudi Wahhabi Salafist form of Islam that Boko Haram follow and that the first BOKO Haram leader, Yusuf, was given sanctuary in Saudi Arabia. Everyone in education, from politicians to teachers it seems, is a fully paid up member of the Finland Fan Club. Finland has been portrayed as an educational paradise, topping or near topping the PISA tables, with a strong economy that makes it the envy of Europe. Big problem – it’s not true. While educators fall for PISA envy, the truth may be somewhat different. While Finland had topped the PISA rankings in 2000, 2003, and 2006, and consistently ranked near the top in other years. In 2013 they were ranked 12th. There’s a clue in the recent maths league table on how to get success – be a small, racially homogeneous country that speaks only one language. Shanghai, Singapore, Hong Kong, Taipei, Korea, Macao, Lichtenstein all feature in the Top Ten. The fact is, the leaning Tower of PISA has always been a false indicator, for many reasons, and here's why. But let's get back to Finland. There's plenty to admire in Finnish education but don't believe the hype - even they don't. 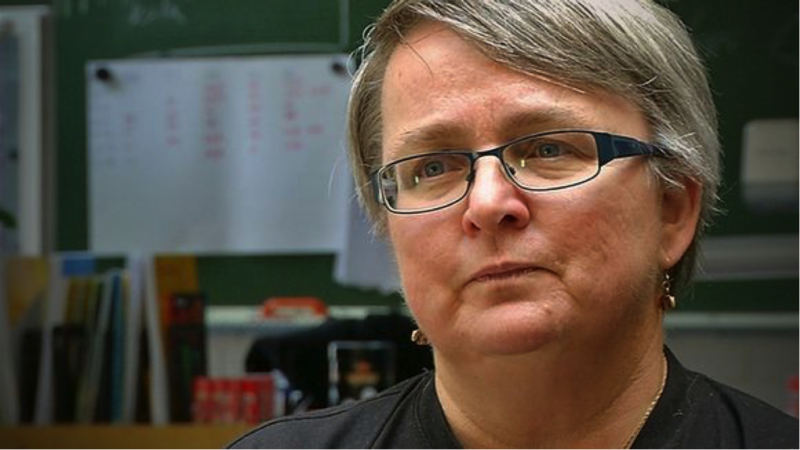 One educational critique has come from an unlikely source, a working Finnish teacher. She’s a whistleblower who exploded some myths with her book Wake up school! Maarit Korhonen, who has been teaching for 30 years, has pushed the leaning tower of Finnish PISA results right over. Scathing about PISA, she claims that the Finnish system is not world-beating but remains myopic and old-fashioned. She claims that, far from being a high performing system, it has become a slave to the PISA madness, happy to score well in these narrow, academic measures, while leaving far too many learners behind. According to her analysis, 2 out of 3 children get substandard education in an overly academic curriculum sitting in rows of desks, working slavishly through a dated curriculum, using dated textbooks. High academic standards among teachers may only promote an even more extreme form of academic education on all children. Many report that the vocational path is weak and exaggerated, not at all a parallel path with any sort of equal status. This is a PISA chart you will never see at conferences. 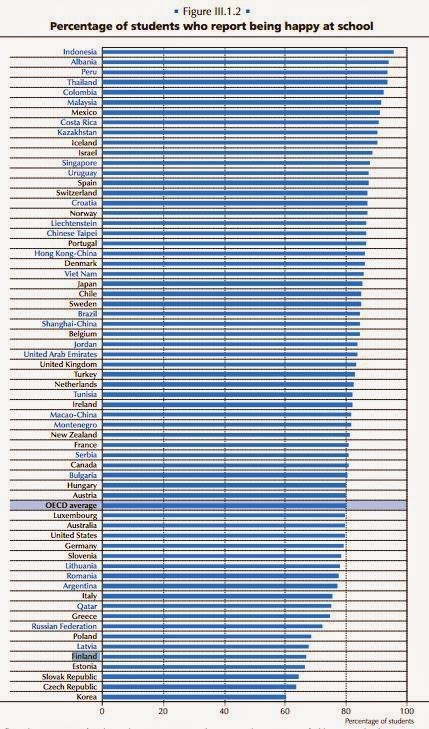 It shows Finland near the bottom of the league table when they measured how happy students were at school. Not exactly the utopian picture that's often presented of a system where the children are nurtured rather than taught at rows of desks to a fixed curriculum. Young people's suicide rate is high by European standards and it is not clear that the education system has had huge advantages beyond school. Wouldn’t one expect a country that has topped the education league tables for years and years to have seen the benefit from such attainments? Yet Finland is expected to be the WEAKEST economy in Europe in 2015. They have already indicated this month that they will object strongly to any debt forgiveness in Greece, as they have plenty of fiscal problems themsleves, which may lead to serious consequences for the whole of Europe. The much heralded education system came at a price, huge, public sector expenditure and rising debt. At the same time another major cause has been an over-reliance on one major company – Nokia, which contributed about a quarter of Finland’s economic growth between 1998 and 2007. But Nokia was destroyed by its competitors, with jobs and the jobs of sub-contractors melting quicker than snow. Nokia once had a 50% market share, it is now less than 3%. The iPhone killed off Nokia and the iPad killed off the paper industry. It’s core industry, the pulp and paper sector has shrunk dramatically with considerable job losses. Angry Birds alone cannot support a whole nation and even they have been laying off staff. On top of this has come Russia and the falling Rouble. This is catastrophic, as Russia is Finland’s largest trading partner and tourism from that country has also fallen. It’s been double trouble – high spending, low tax returns. Finland is the new Greece. I saw Pasi Sahlberg give a talk called What if Finnish teachers taught in your schools? He posed a few fascinating questions to show that you must tackle improvements in your educational system holistically. It is not JUST about quality teachers, the mantra we so often hear. It comes as no surprise that Finland is flaunted as being the ideal by educationalists, because it sees teachers as the sole key to success. We may have to rethink this. If true, why then have they performed poorly in TIMMS? Teachers alone are not a sufficient condition for success. In fact, Strahlberg doubts that the Finnish system is easily transferable at all. Will they listen? No. Nicky Morgan, only this week reiterated the fact that PISA will be her key to heaven and used to measure the success of recent reforms. Rather than look for good evidence-based practices in education, politicians heads have been turned towards PISA, as if it were some utopian, objective benchmark. It's not that Finnish education is bad, it's just time to drop our membership of the Finland Fan Club and look at evidence beyond PISA. 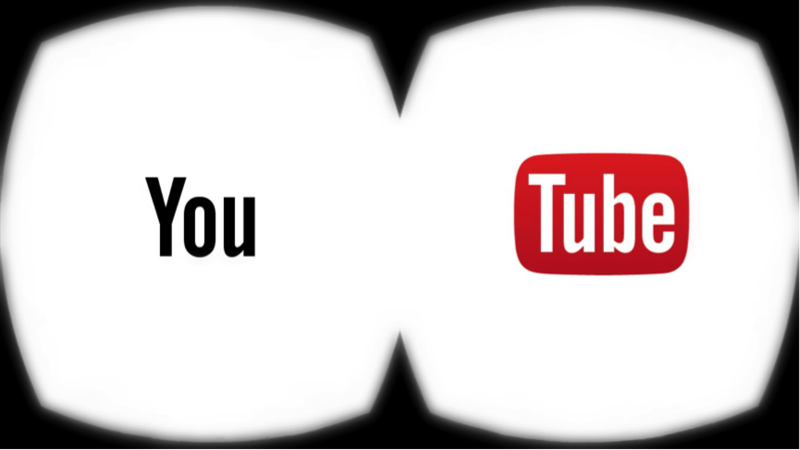 YouTube is to support 360 degree video. A small step for the internet but a huge step for 3D and eventually VR. It has its competitors, such as VCEMO, Littlstar and Vyuu but YouTube, I suspect, could crush them with ease. VR is a medium, not a gadget and needs an ecosystem of development, distribution and devices to create a rising tide. The devices are coming, with Oculus Rift leading the charge but lots of other cheaper and simpler options, including Gear VR. The games developers are building a critical mass of VR ready games for the oculus launch. In steps, YouTube and other streaming services will move into this space, from 2D to 3D. Note that this service is all about streamed 360 degree video, which is way short of full, head-tracked, 3D, Oculus-type experience. Although one would expect this to come in time. 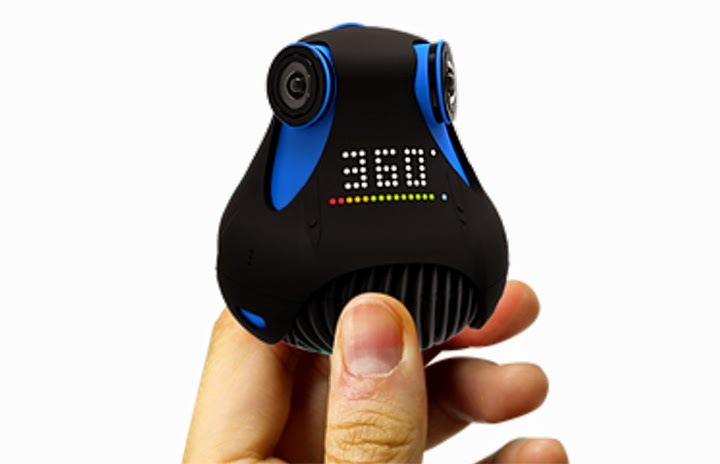 France’s Giroptic raised $1.4 million on Kickstarter for a full 3D 360 degree camera and this is the first to be supported by YouTube. But they will not want to be device-limited and support for market winners will come. This first move makes sense as these videos fall right into the expansion of Google’s Street View. This opens up the floodgates to the crowdsourcing of 3D, 360 degree content and its eventual use in true VR. What will people do with this stuff? 360 degree then 3D images of the real world, in terms of places and destinations, such as art galleries, museums and do on are an obvious first hit. Street View, travel destination stuff, cultural stuff, estate agent stuff. We’ll be able to sample it all. Live experiences, such as music concerts will quickly follow. 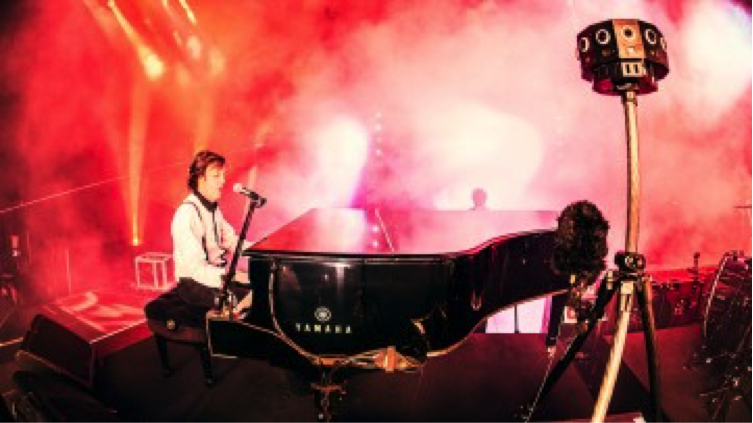 Paul McCartney’s ‘Live and Let Die’ Performance is Jaunt VR’s first publically available, cinematic VR content. Filmed in front of 70,000 people you can stand anywhere you want, look and move around, in true VR and 360 degrees, just as if you were there for real. In addition, there’s true 3D or at least omnidirectional audio which reacts to your position as you move around. This video will be released for the Oculus and Gear VR. Other live events could include sports and theatre. Imagine being able to hover above the centre-spot and move around the field to watch football. It’s coming folks. I've already given some examples and explained why VR is a medium not a gadget, supported by 7 strong learning principles. We also have some learning applications, such as Caspain Learning's Social Care and Construction training programmes (funded by Ufi). That leaves distribution. Media are largely 2D – print, graphics, animation, video, film, TV and games. Yet, we live in and perceive a stereoscopic 3D world. It is only a matter of time before consumer technology brings experiences to our brains in 3D. We also live in a more open media world where content can be found, for free on the web. One would expect this to be true for VR content. And so it will be.